Vatican II radically transformed the Roman Catholic Church, including convents and monasteries, around the world. 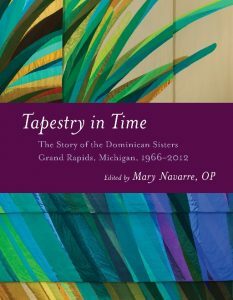 In this book several Dominican Sisters tell candidly what life was like for them in Grand Rapids, Michigan, during the decades after Vatican II. The story they tell is one of change, growth, and empowerment. Organized around the four essentials of Dominican life — prayer, study, common life, and ministry — Tapestry in Time weaves together written and oral histories from the Sisters themselves to describe how the introduction of then-radical changes such as worship in the vernacular provided the thrill of something new and meaningful — but also how the move toward greater inclusivity led to challenges and opposition.